CI-WATER’s Data and Modeling team is developing easy-to-use interfaces to make sure that the tools produced and data aggregated by CI-WATER can be used and shared by the people who need them. Behind the scenes, the simulations CI-WATER makes available require massive amounts of data from diverse sources. For instance, accurately predicting water availability for a particular watershed can depend on not only projected human factors and natural conditions, but changing weather patterns. CI-WATER researchers are building information systems between resources so users can simply enter their parameters and find the information they need. 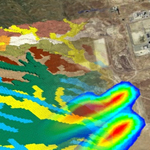 The Data and Modeling team has brought together various models to make it possible to assess water resources with a new level of breadth and depth, and are developing applications so that hydrologic researchers, water managers, state planners and others can access CI-WATER’s advanced models without needing to become experts in high-performance computing. The result of this effort will be water resource management tools that can provide clearer forecasts of future availability, be adapted to other regions and support postive outcomes in the future through responsive, research-based planning. Tethys is a development and hosting platform for deploying water resource models on the cloud for decision support. Tethys significantly lowers the barrier for cloud-based app development, simplifies the process of accessing scalable distributed cloud computing resources, and leverages additional projects for data and computationally intensive modeling. The water level mapper app displays statewide maps of the depth to groundwater for the state of Texas for the years of 1980 to 2012. The maps can be animated to see how depth to water changes over time. Additionally, users can click on any location in the state to generate a time series plot of the depth to groundwater for that location. Visualization of a 2008 winter storm from one of the high-resolution climate simulations being developed for Utah by Court Strong and Adam Kochanski. The northern part of the Wasatch Range runs down the middle of each image, with the Bonneville Salt Flats appearing white toward the upper left with the Great Salt Lake to their right. Winds at 300 meters above the ground are shown by the arrows and the three-dimensional structure of clouds is visualized in white. Presented by Adel Abdallah and David E. Rosenberg. at the World Environmental & Water Resources Congress on June 1-5, 2014 in Portland, OR. Presented by Adel Abdallah and David E. Rosenberg at the American Water Resources Association, GIS & Water Resources VIII: Data to Decisions on May 12-14, 2014 in Snowbird, UT. Presented by Nathan Swain at the CI-WATER Cyberseminar on February 12, 2014. Presented by Herman Dolder and Fidel Perez at the All Hands Meeting on October 10, 2013 in Salt Lake City, UT. Presented by Steven Burian, Court Strong, Erfan Goharian, Adam Kochanski, and Debadrita Das at the All Hands Meeting on October 10, 2013 in Salt Lake City, UT. Dolder, H., Jones, N., and Nelson, E. (2015). "Simple Method for Using Precomputed Hydrologic Models in Flood Forecasting with Uniform Rainfall and Soil Moisture Pattern." J. Hydrol. Eng. , 10.1061/(ASCE)HE.1943-5584.0001232, 04015039. Tarboton, D., Horsburgh, J., Dash, P., Gichamo, T., Yildirim, A., Jones, N., 2014. Data Services in Support of High Performance Computing-Based Distributed Hydrologic Models: Abstract H13H-1211 presented at 2014 Fall Meeting, AGU, San Francisco, Calif., 15-19 Dec, https://agu.confex.com/data/handout/agu/fm14/Paper_29684_handout_1492_0.pdf. Youn, C., V. Nandigam, M. Phan, D. Tarboton, N. Wilkins-Diehr, C. Baru, C. Crosby, A. Padmanabhan and S. Wang, (2014), "Leveraging XSEDE HPC resources to address computational challenges with high-resolution topography data," Proceedings of the 2014 Annual Conference on Extreme Science and Engineering Discovery Environment, Atlanta, GA, USA, July 13-18, ACM, Extended Abstract, http://dx.doi.org/10.1145/2616498.2616564. Fan, Y., Y. Liu, S. Wang, D. Tarboton, A. Yildirim and N. Wilkins-Diehr, (2014), "Accelerating TauDEM as a Scalable Hydrological Terrain Analysis Service on XSEDE," Proceedings of the 2014 Annual Conference on Extreme Science and Engineering Discovery Environment, Atlanta, GA, USA, July 13-18, ACM, Extended Abstract, http://dx.doi.org/10.1145/2616498.2616510. Jones, N., J. Nelson, N. Swain, S. Christensen, D. Tarboton and P. Dash, (2014), "Tethys: A Software Framework for Web-Based Modeling and Decision Support Applications," in D. P. Ames, N. W. T. Quinn and A. E. Rizzoli (eds), Proceedings of the 7th International Congress on Environmental Modelling and Software, San Diego, California, USA, International Environmental Modelling and Software Society (iEMSs), ISBN: 978-88-9035-744-2. Yildirim, A. A., D. Tarboton, P. Dash and D. Watson, (2014), "Design and Implementation of a Web Service-Oriented Gateway to Facilitate Environmental Modeling using HPC Resources," in D. P. Ames, N. W. T. Quinn and A. E. Rizzoli (eds), Proceedings of the 7th International Congress on Environmental Modelling and Software, San Diego, California, USA, June 16-19, 2014, International Environmental Modelling and Software Society (iEMSs), ISBN: 978-88-9035-744-2. Adel Abdallah, David E. Rosenberg (2014). 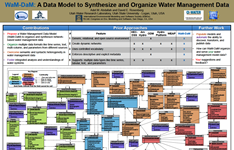 "WaM-DaM: A Data Model to Organize and Synthesize Water Management Data." International Environmental Modelling and Software Society (iEMSs) 7th Intl. Congress on Env. Modelling and Software, San Diego, CA, USA, Daniel P. Ames, Nigel W.T. Quinn and Andrea E. Rizzoli (Eds.). Strong, C., A. K. Kochanski, and E. T. Crosman (2014), A slab model of the Great Salt Lake for regional climate simulation, J. Adv. Model. Earth Syst., 06, doi:10.1002/2014MS000305. Strong C. The balance and future of water for the Wasatch Range. Invited by Watershed Sciences Department, Utah State University, Logan, Utah, 25 February 2014. Strong C. The balance and future of water for the Wasatch Range. Invited by Department of Plant & Wildlife Sciences, Brigham Young University, Provo, Utah, 7 November 2013. Strong C. Understanding and using climate models for teaching. Workshop invited by CI-WATER Professional Development Summer Institute, Salt Lake City, UT, 24 June 2013. Kochanski A., Strong C. Introduction to using output from Weather Research & Forecasting (WRF) model. Cyber-seminar for CI-WATER teams (Utah and Wyoming). Salt Lake City, Utah, 12 June 2013. Strong C. Global change and its local impacts, Monthly meeting of Humanists of Utah, Salt Lake City, Utah, 14 March 2013. Strong C. The future balance of water along the Wasatch Range and Front, Utah Geological Association,11 February 2013. Strong C. Current and future hydrologic cycle of the Wasatch Range and Front, Department of Plants, Soils, and Climate, Utah State University, 7 November 2012. Smith K, Strong C, Wang S. Coherence between Great Basin precipitation and low frequency Pacific Ocean variability in CMIP5. Poster presented at American Geophysical Union Fall Meeting, San Francisco, California, 9-13, December 2013. Stwertka C, Strong C, Kochanski A. The water balance of the urban Salt Lake Valley. Poster presented at CI-WATER Symposium and 2nd Annual Conference, Salt Lake City, UT, 29-30 May 2013.